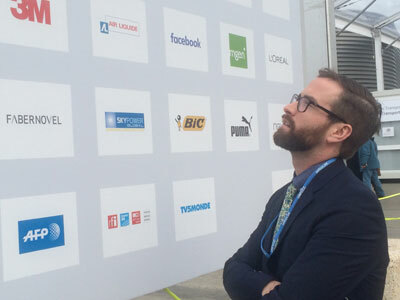 A veteran reporter on climate issues provides a glimpse into a corporate responsibility activist’s efforts during the recent Paris climate conference. As the Paris climate conference got under way last December, Jesse Bragg introduced himself to me on a crowded shuttle bus between the converted airplane hangers where negotiators were meeting. He’d read my ID badge and noticed that I was from Boston. He said that he worked at Corporate Accountability International’s headquarters in downtown Boston. We soon realized we live just miles apart. Jesse Bragg, a spokesperson for Corporate Accountability International, reviews list of companies helping underwrite Paris climate conference. I’d never heard of Corporate Accountability International, nor of its mission – to make private corporations answerable to public institutions. But the encounter gave me the chance to satisfy a curiosity. With more than 30,000 visitors expected at the conference and sitting through nearly 3,000 meetings and drinking some 71,000 cups of coffee – what were they all doing? Each of the nearly 200 national delegations needed many staff members. The number of delegates registered from the US – including four cabinet secretaries and more than a dozen senators – filled four pages of the official roster. Even tiny Haiti, among the world’s poorest nations, listed 15 delegates. All told, governments had sent 19,200 representatives to Paris. Altogether, media organizations had dispatched nearly 2,800 journalists. I understood roughly why these people were there. But what about the 8,300 “observers,” including industry and nongovernmental organization representatives? Jesse was one of them, and I asked about his plans in the coming 10 days. We agreed to meet the following morning. In the 1990s, Corporate Accountability had helped draft, and then lobbied for, the 28-word Article 5.3. The WHO subsequently issued guidelines elaborating on its terse language, helping countries to combat “efforts by the tobacco industry to undermine or subvert tobacco control.” Over time, a number of countries have adopted regulations governing contacts between health officials and the tobacco industry, including rules restricting lobbyist’s gifts and requiring “cooling off” periods after leaving government jobs to slow- down the revolving door between the public sector and industry. It is now “widely recognized that it is no longer acceptable to interact with tobacco when you are talking about public health,” Jesse said. Along with representatives from several other environmental and anti-corruption organizations, Jesse hoped to get similar language added to the Paris climate agreement, a “a tall task,” he readily acknowledged. “The word is out that this is the moment to do this,” Jesse said. “Civil Society is behind it.” But only official country delegates could actually propose language to the agreement. He and his allies were in talks with contacts from “global south” — that is, less-developed – countries. He wouldn’t say which ones. We agreed to touch base in a few days. I called Olivier Hoedeman, a researcher and activist at Corporate Europe Observatory – a group opposed to industry lobbying in EU countries – at his Brussels office. He said that the 2013 climate conference in Warsaw had convinced activists to try to curb the influence of fossil fuel producers and energy-intensive companies, who, he said, seemed to have captured climate negotiators. Industry – including many major companies long opposed to taking action on global warming had heavily sponsored the event. The World Coal Association convened a parallel meeting, at which – to the horror of activists – Christiana Figueres, the chief of the climate conference, had made a keynote speech. On the last day of that conference, 800 people from Greenpeace, World Wildlife Fund, Oxfam, 350.org and other organizations had walked out, protesting industry lobbying. “That was the low point,” Hoedeman said. Industry, he said, had mustered a “massive presence” at the Paris conference, paying about 20 percent of the tab for putting on the event. It had its own meeting rooms in the summit venue, squads of lobbyists, dozens of company kiosks, and corporate logos plastered onto walls and promotional charging stations. Corporate interests tried to turn the negotiation into “a trade fair,” he said. He doubted their funding came with specific strings attached, but still it symbolized “an unhealthy relationship,” with governments in effect accepting handouts. In a spiffed up hanger near the media center, a business lobbyist named Nick Campbell, from the United Kingdom, seemed flummoxed when asked about putting anti-corruption language in the agreement. We sat on an overstuffed couch next to the German delegation’s posh pavilion. On one of the final conference days, Jesse looked tired, and also grim. He had failed to convince any delegate to include a transparency line in the agreement, and now it was too late. He said that before the conference had opened, the U.S. had “streamlined” the agreement so thoroughly that many of the “core positions,” of his allies had been removed. “They were stressed about just getting text back in,” he said, and had no time for drafting anything new. It was, “an issue of priority, not lack of interest.” He said he still hoped that some delegate would make a “ministerial declaration,” on the topic – in effect making a floor statement during debate. issue a “ministerial declaration” – a sort of a non-binding referendum – on the topic. As French Foreign Minister Laurent Fabius gaveled the conference to a close, it was clear there had been no ministerial declaration either. Still expressing optimism, Jesse said he had convinced some delegations of the importance of provisions to prevent corruption and to increase transparency. “Our presence here is not futile,” he said: he had already started a campaign “to advance this between now and the end of Marrakech,” the next climate meeting, in December, 2016. Grossman’s reporting from Paris is supported by the Pulitzer Center on Crisis Reporting. Please link here for more on Yale Climate Connections.